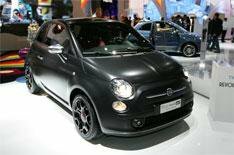 Fiat isn't taking the wraps off any new models at the Paris show, but it is building on its recent successes. So what is new, then? Theres some clever new engine technology, including engine stop-start systems, and a show car to celebrate the production of the 500,000th Fiat 500. The 83bhp 900cc twin-cylinder Twinair is a taster for a whole new family of engines, with power outputs between 64bhp and 104bhp. Although theres no announcement in which cars these engines will end up, four are fitted to four different 500 models at the show. Talking of the 500, the 500 Thousandth is at Paris to mark the 500,000 units of the supermini that have been produced in the 31 months since its launch. Theres also the new Blackjack special edition, finished in black with an opaque surface treatment, and a 500 by fashion label Diesel. Fiats is also pushing its green credentials, with a number of models fitted with the Start&Stop system. This includes the Qubo, Punto Evo, Bravo and Doblo.